It's so beautiful, Debra! Wonderful textures throughout; I love how frayed the ends are!! You wouldn't think a rope could be so aesthetically pleasing, but that it is. So well drawn and coloured - fantastic. Incredible how you manage to put art into anything....and getting the ideas! Another beauty! I like this SO much. The simplicity of the single rope on the white ground, and yet the complexity of the fibers. It's awesome! I really like it how you can turn such a simple thing in to a beautiful painting, well done!!! Wonderful, Debra. As I look at this I know that I would have no idea 'how' to even start, with all that detail! Wow, beautiful! Amazing how something so simple has an attitude! Stunning. Your neighbor will want the painting. Your drawings and your style never stop amazing me Debra =) Everything looks so detailed but I really like how they look so subtle in so many different angles. Love it! This is lovely! It looks so realistic but keeps a 'painterly' aspect! Love the interest, color and detail in such an ordinary everyday object. But then again I guess that what art is :) superb! Lovely work..I like the title 'coming undone' too! I really, REALLY, love this! 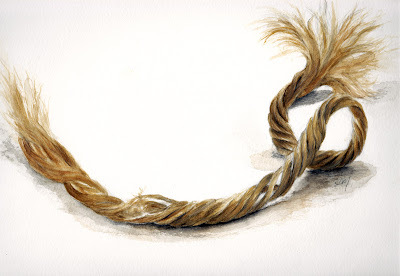 The subject, composition, simplicity of treatment, you have turned this bit of frayed rope into a very elegant statement! This is really stunning, and beautiful in its own, very "zen" way!